The Jungle Book has long standing as a personal favorite Disney animated feature of mine. It is one of those films that is easy, yet inexplicably difficult, to rationalize for me. It is a movie that I always think fondly of, but never go out of my way to seek out. It is the film that, along with Robin Hood, I most closely relate to my father. This, even above Robin Hood, was the movie he would throw on when I was a child on a Saturday afternoon. He would lay on the floor and I would curl up near him, until I need more space and moved up to the couch. A nap would generally follow close behind, usually somewhere around the point when Bagheera and Baloo would have their heart to heart after escaping King Louie with their fur attached. I have known for a long time that these type of nostalgic feelings will garner my attention when brought back up around the parks and resorts, and I’m certain that Disney knows this about all of us as well. It is the reason my wife thinks that I Wanna Be Like You follows her around Walt Disney World, a few notes of the Ballad of Davy Crockett and I’m a child back listening to someone playing the guitar at Fort Wilderness, and why we all crave those park music loops and theme park albums to listen to once we get home. It’s rare for me, however, to create new musical memories tied to Disney. In February of last year I happened to be in Disneyland for a conference (I know, it’s a tough life). I happened to be staying in at Paradise Pier while the majority of my friends, co-workers, and other conference goers we at the Disneyland Hotel. This had happened because I had waited too long to book my room and had to board within walking distance. From here I could tell you all about the harrowing journey my friend and I had in simply getting to Anaheim or about all of the fund he and I had, and the missus and I once she arrived after the conference, taking in all things Trader Sam’s, but this is a story set down about music and The Jungle Book. My contingent of co-workers found themselves all in the Adventure Tower of the Disneyland Hotel. Having a slight, and I do mean slight, walk each morning and my innate ability to not be able to adjust to time changes well, I would undoubtedly find myself making my way over to the their area of the resort early each morning. 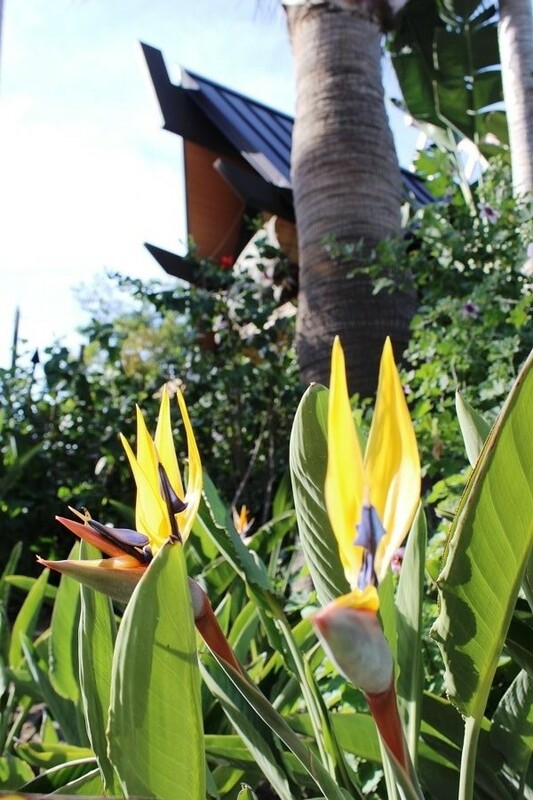 Most of those mornings I would pause along the pathway between the Adventure Tower and Trader Sam’s to listen to take in the flowers and scenery, and maybe catch a glimpse of rabbit or one of the Disneyland cats (I’m looking at you Ned). I would venture into the lobby and marvel at the lights, pour over every detail of the Adventureland concept art, and examine the maquettes from the Jungle Cruise with more attention than they probably get in a month of Sundays. Since I was on my own, my only real company was the generously provided background soundtrack provide by Disney. 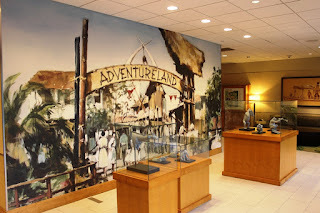 Each loop around the resort was expertly crafted, but it was the Adventure loop that really beckoned to me time and again. In fact, it was a single piece of music that I heard several times over the course of that week that stuck with me, The Jungle Book’s Overture from George Bruns. It is music that I instantly knew, and yet found it hard to immediately place. Something about the slinkiness of the brass flute that wound through the piece like a dark, winding river or a snake meandering through the trees and tall grasses reached out and took hold of me on those mornings. It felt wild and peaceful all at the same time. Those brief moments when I could pause and just fall in love with the world around me were a gift. Bruns’ Overture gave me a sense of calm and set me up perfectly for long days of learning and put a joy in my heart that, looking back, must have been calling to a distant memory of the lazy Saturday afternoons of watching The Jungle Book. I make plenty of memories at Walt Disney World and Disneyland still, even when I’m on a solo trip. As a rule, however, they almost always include friends or family that I interact with on the trip. Rarely are there moments that I find on my own that I alone am the steward of. Bagheera opens up his narration of The Jungle Book with these words, “Many strange legends are told of these jungles…” It just so happens that this is my story from the jungle, and it bring me untold joy. Anytime I uncover a story within the Disney environments I love relaying them back to the people that they remind me of or to memories we may have shared together at one point in time. I’m sure we’ve all had a moment or two like that within our own Disney adventures. So, tell me, where do you find the intersection of Disney, music, and your fondest memories? To come to that intersection where all 3 parts of your question are answered, I guess I start with my "Top 20 WDW Moments" (yep, I actually have a list). My #2 moment is the one I will go with. It happened in Sep. 1992 at the Odyssey Restaurant in Epcot. They used to have a dinner there and Mickey & Friends performed, then came out to greet everyone. I could sing the song but I don't know what it's called. But it's that song and the video we made (which does not include that particular song) that we called "My Ultimate Disney Moment". It was.... well... I don't have words. Go here --> https://www.youtube.com/watch?v=BTatK9skznM.